Tamaar Padaar malayalam movie (film) to be directed by debutante Dileesh Nair will have Prithviraj and Biju Menon in lead. As the title states, the movie will be creamed with humour at its best. The director himself has penned the script for the movie. 'Tamaar Padar' is produced by Renjith Rejaputhra under the banner of Rejaputhra Films. With rest of the cast finalized, the first schedule of the movie has started on 16th April at Sabarimala while the main location will be Thiruvanathapuram. Prithviraj who is taken wise decisions in the past has been very choosy in selecting roles. This astute thought has given him back to back successes. The actor, who has shown his mettle on the silver screen donning serious and dark roles, now has decided to change the track attempting to do a movie tagged under the category of humour. Riding on the magnificent success of 7th Day', actor Prithviraj is all set to don the lead role in Dileesh Nair's directorial debut. This full-length comedy entertainer titled 'Tamaar Padaar' will be blessed with the presence of Biju Menon who will add more fire to hilarity. Creamed with humour at its best, 'Tamaar Padaar' would be a complete family entertainer. The director himself has penned the script for the movie. 'Tamaar Padar' is produced by Renjith Rejaputhra under the banner of Rejaputhra Films. The first scene of the movie was canned at Sabarimala while the main location will be Thiruvanathapuram. It is truly a rare incident concerned with this movie as it is too difficult to get permission at this location. Dileesh who has scripted for movies like 'Salt and Pepper' and 'Da Thadiyaa' is aiming to create his own space in the malayalam film industry. Prithviraj known for essaying serious characters has shown his skill in as comedian in movies like Thanthonni and Pokkiri Raja. With the title being the soul of any movie, 'Tamaar Padaar' sounds quite exciting. After showing his caliber in matured roles featuring in Mumbai Police and Memories, will be featured in a new face. The other upcoming projects in line for Prithviraj are Picket 43, Ennu Ninte Moideen, unitled project with Shaji Kailas and one movie each in tamil and hindi. 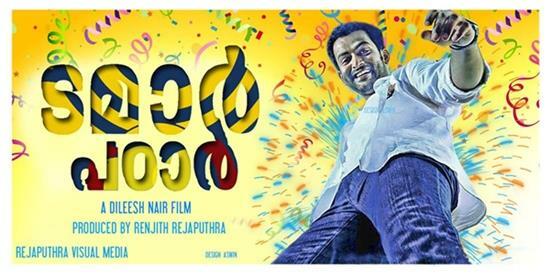 As comedy movies have much demand, the movie lovers are waiting to see Prithviraj in new avatar. After the post production works, the movie would reach theatres in the last quarter of June.